Hot off the press from their excellent first anthology – Horde Comics Volume 1 – here’s 10 questions with Andy Conduit-Turner about digital comics! I’m Andy Conduit-Turner. I primarily write and produce comics with my friends over at Horde Comics as well as a few other places. 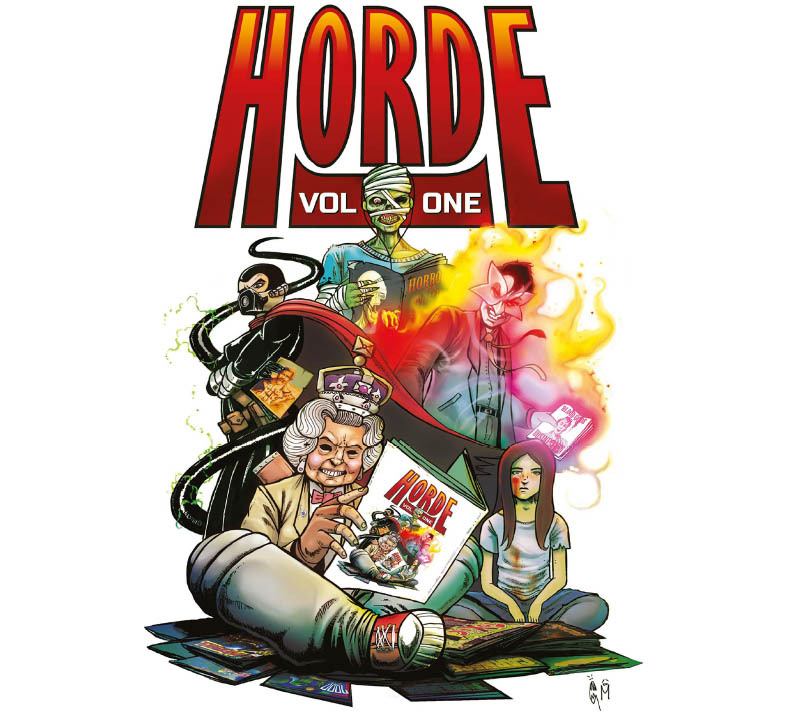 Right now, we’re celebrating the release of our debut book, Horde Comics Volume 1. This first book is our way of introducing ourselves to readers with a mix of short stories – We’re really proud of the final comic, and hope others take to it as well. Next on the agenda is writing for Volume 2 of our anthology as well as some longer form stories. The first you can expect to see is the opening issue of a four-issue mini-series from David Killian with Art from Beth Varni who we worked with on one of the shorts (Berserk) from our first book. I first got into digital comics while I was working abroad. Comics were only readily available in the local language (which I was awful at reading) so having books shipped over from home A) Cost the Earth B) Would need to be shipped back or abandoned when I went home. So digital was a great way to avoid my reading material drying up. Even now I’m back at home the appeal of digital remains for when I’m travelling and to retain precious shelf space. What do you think works with digital comics?There are some comics that make the most of the functions of the medium well – The use of guided view is just one element that people regularly mention that can really give a dynamic reading experience but it’s far from a one trick medium. There are some great examples of the format being used in Batman ’66 – Replicated backgrounds with subtle changes in character movement or lettering bubbles allow for more fluid delivery of dialogue and action scenes. Take this methodology to it’s fullest extent and you have full, pseudo animated comics, DC did a great production of Red Son. Back in the Indie world our artist friend Gregg used a similar technique to animate some of our comic panels for us to use as a trailer for our book. You could argue that somewhere along this line, these become animated features rather than being comics anymore, but the variety is appealing. Can digital comics replace print comics?I’d say no, not entirely – While I buy a lot of comics digitally, physical copies, especially of a book I especially enjoy will always be essential – For cons and Comic store visits, the benefits of physical copies will always hold appeal for those who want something real to take home. We’ve experienced this first hand with our own book. When we Kickstarted the book we provided all of the physical backers with a digital copy too to avoid needing to wait. I was pretty shocked how many of them got in touch to confirm that they were waiting until their physical copies arrived before reading, so it seems printed comics are still very much the preference for a lot of people. How can print comics work with digital comics?Primarily they provide choice and variety – I’m always a fan of when a physical copy comes with a digital download too. Having the two mediums work together is best for comics overall. Digital Deluxe versions are also a nice touch for those interested in behind the scenes back matter for their comics…it allows creators to share more of their process and some of the great concept art that may never otherwise see the light of day without putting printing costs (and by extension cover prices) through the roof. What don’t you like about digital comics?The lack of a physical item, though good for the state of my bookshelves, sometimes can leave me feeling a little hollow, and there still isn’t the same ability to browse (either when shopping or your own collection) in quite the same way as you can with physical, flicking through books on a shelf or in a long-box. I can sometimes find pricing of digital an issue, especially the tags some producers put on collected editions – While I can see some of their justifications, especially those that are designed to avoid hugely undercutting retail and wiping out physical sales it doesn’t make huge prices on digital collections any less off-putting as a consumer. What digital comics/webcomics do you read?Most of the content I read comes from Indie creators direct and I pick up a lot from Kickstarter campaigns just a few recent examples were Lady Hollywood from Cult Empire Comics and the latest issue of Sarah Millman’s NPC Tea. I also have a Comichaus subscription so browse for a lot of Indie titles on there. For comics from the bigger producers I’m a sucker for a big collection (when the price is right) but I’ll also use the platform to have a look at a new series ,and subscribe if something really takes my fancy – Latest pick ups on those fronts were Mags Visaggio’s short series of Transformers vs Visionaries and Gail Simone’s new Domino run. Where do you see digital comics going from here?I’d expect to see more technology integration, some that will stick and others not so much, lots of companies are still pushing VR and the install base is growing. Even with our standard phones and tablets etc there’s a lot of innovative folks out there so I’d expect people to keep experimenting with the format. At this point, given the popularity of comic book films It’s a mystery to me that integration with comics has only really be done at an ad hoc level between Cinemas and Local comic stores (pop up shops on the release of big movies etc) – Having a big player like Marvel or DC give digital comic downloads or free weekends on their various digital services printed on movie tickets seems like such a simple win to attract new readers who enjoy their movies I’m surprised it’s not already a thing. Who do you think we should look out for in digital comics?Aside from a shameless plug for myself and the Horde Comic gang (but seriously, please do look out for us.) There’s an incredible amount of talent in the small press scene producing great content, and digital is just the place to pick up books from these people if time, geography and / or postage costs make picking up their physical books either by direct order or at cons a struggle. There’s far too many to make an extensive list here but I’d recommend getting on board with an outlet that showcases great indie work be it a website like this or a podcast like the Awesome Comics Podcast (whose recommendations cost me a fortune) In the interests of providing some picks myself though I’ll add that this year alone, Fraser Campbell’s the Edge off and Ryan K Lindsay’s Eternal have been real treats and the announcement that the Madius Comic guys are working on a new issue of Tragic Tales of Horrere has been the highlight of my week.